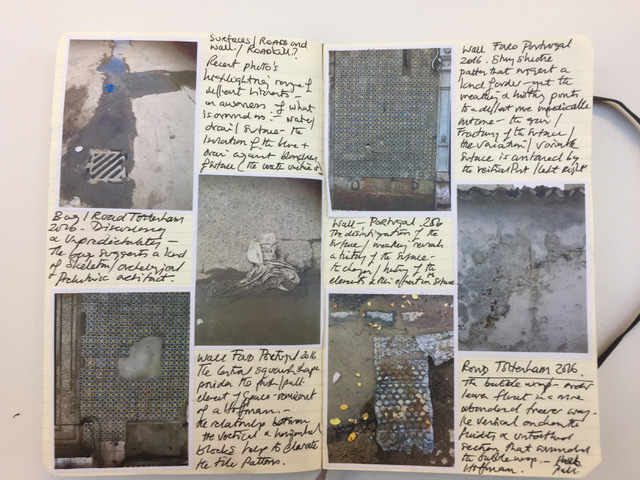 I keep a journal in a note book, which builds over time and contains photos, studio shots and images of work in progress, writings as well as finished work. The present notebook records some events from Sept 2015 to current work. Early September I started the recent series of paintings including the original choice for the diary – entitled ‘Just as was Told Degenerative/Regeneration’, I had posted the relative incarnations on Twitter sadly the painting still hasn’t been resolved and may well be consigned to history. 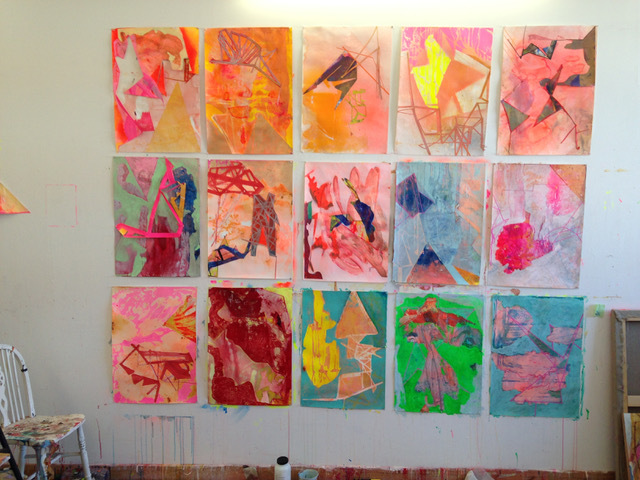 However another set of paintings that has evolved out of the process. 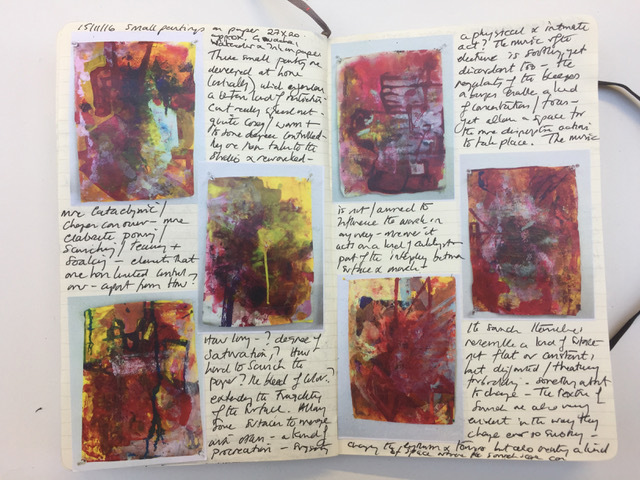 Whilst the diary isn’t about one painting in particular, in effect the diary relates to the process of thought, exploration and decision making that is prevalent though my practise. As such the painting –The Future that was! 2017 will form the basis for the diary. In early Sept 2016 I came read an essay entitled Painting Photography Painting Timelines and Medium Specificities by Carol Armstrong from Painting Beyond Itself (The Medium in the Post-Medium Condition), which has provided a stimulus for recent work, indeed the phrase ‘Mediums are go-betweens’ struck a chord with me; I was particularly interested by the term ‘The Medium’, which I understood not to mean the literal materiality of a painting e.g. the paint or the support etc. Instead I understood the medium to be a kind of became an intervening substance through which impressions are conveyed to the senses; furthermore I became interested in the ways the elements (within the painted surface) themselves can change/act/inhabit within any given environment; the – ‘the go-between’ refer to the point at which something changes – the transformation. The essay further stated that the ‘medium acts through which a form acts on objects at a distance or any substance considered with regard to its properties as a vehicle of light and sound. – another connection alluded to the medium could be a pervading or enveloping substance –a substance for example where an organism lives, grows and adapts, especially one in which microorganisms, cells etc. are cultured, – or ones environment, condition of life, even a kind of visual social setting. My Interests lie somewhere in between; My recent work focuses upon this nature of the ‘go between’, and apart from the obvious references colour, texture and surface, structure and so on –there are other external factors that are key to the of the work, although not necessarily obvious references for example the repetitive bleeps and blurts of electronic music including Brian Eno and others which offer a kind of infinite special sound scape that is in itself suggests a ‘go between’ state. Furthermore I am looking to explore a spatial environment where different kinds of forms can coexist. These forms are defined by their differences, digital, fluid, gestural, geometric and dissonant relations which create tensions within the grounds in which they inhabit. Adjectives such as seductive, repulsion absorb and rejection concealment – revelation can be used to explain or place a label on the individual elements, yet is the tension within the space that exists as a relationship between the components that interests me. 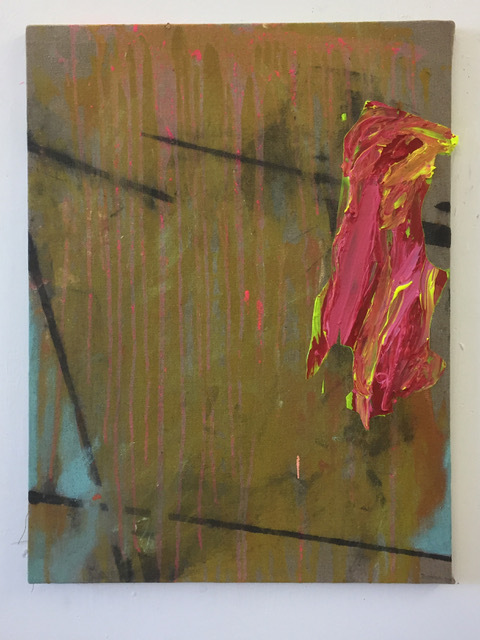 In a sense the paintings explore a hybrid environment where the balance between the fluid, the plastic and the digital is explored through a ground that is both absorbent and present. I can’t remember where these quotes come from, but I have found them relevant. 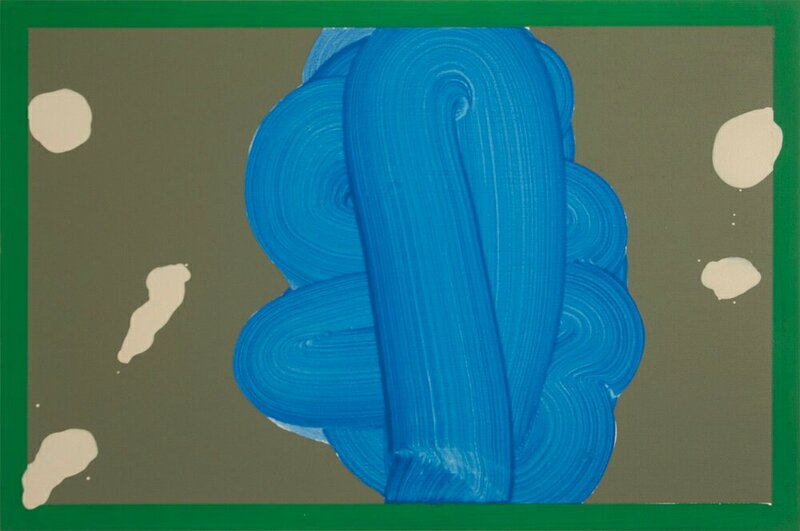 ‘We move through the space –it doesn’t move through us’ – what is seen – how to navigate through the painted surface? 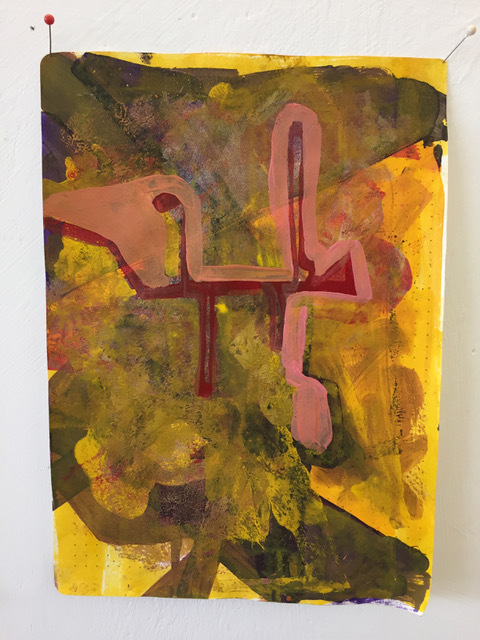 I often make small drawings and paintings at home, often while watching TV which enables me to explore possibilities where I’m disconnected and enables decision making that I hope removes any preciousness in the work. Photos –images that might have a connection to the work in some way, a surface, structures, Incongruous elements that frequently appear on the surface of the roads in and around the studio, the studio is in an industrial estate in Tottenham and the pathways and roads constantly changing, mainly through the different kinds of debris that inhabit the space. 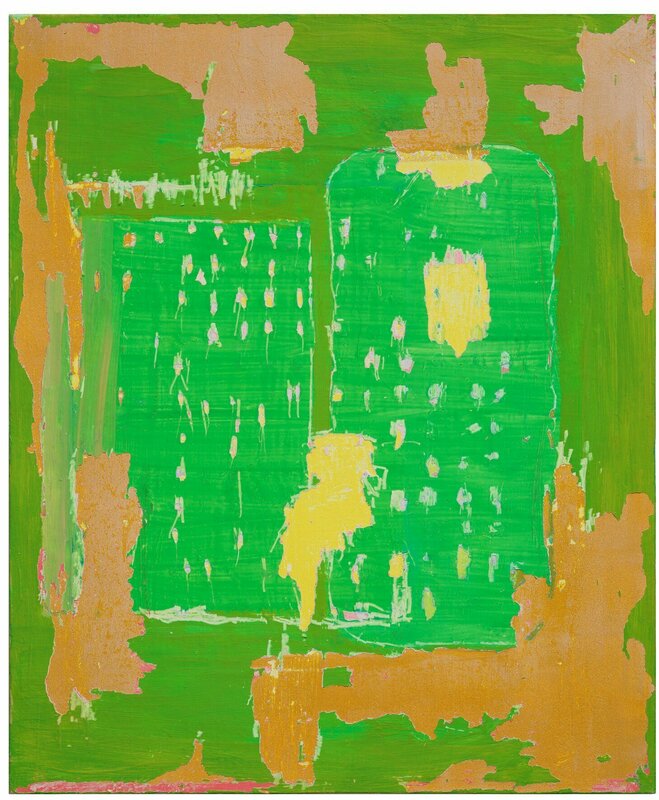 ‘Oranges and Sardines’ catalogue – having read this a number of times, I keep returning to the question of an abstract space/silence of the mind spiritual is abstract? No content? A void or voids? Saying everything and nothing – opening a space within the mind – filled with a presence without meaning? Abstraction forcing the mind into a state of wonder. Julie Mehrutu’s notes on painting – the mark/s are insistent! Shift with each motion that devour, decimate their place until they morph/shift/fuse into the surface. divisive. 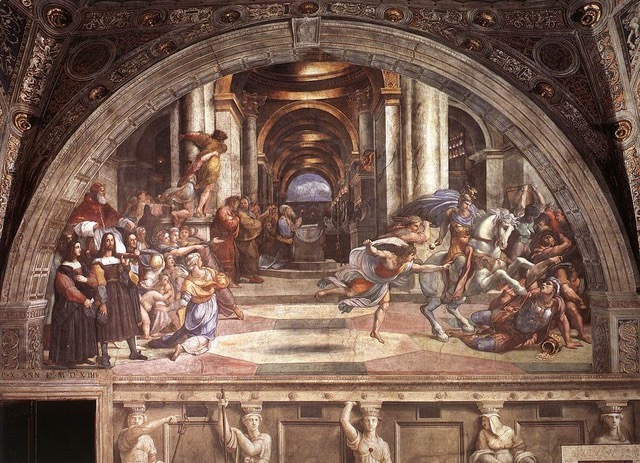 Carrier references Raphael’s ‘Expulsion of Helioodorous’ great void in the centre of the painting, decisive actions taking place at the extreme edge of the painting? Components – (I have tried to consider and restrict myself to a discreet number of elements within a painting – it doesn’t always work and I find it difficult not to tinker – often to disastrous outcomes). These are in no particular order.